EXCLUSIVE: The Kennedy brothers’ ARCHIE MEETS BATMAN ’66 #5 cover — revealed! Jerry Lewis, Sammy Davis Jr., Edward G. Robinson — and now Betty and Veronica! 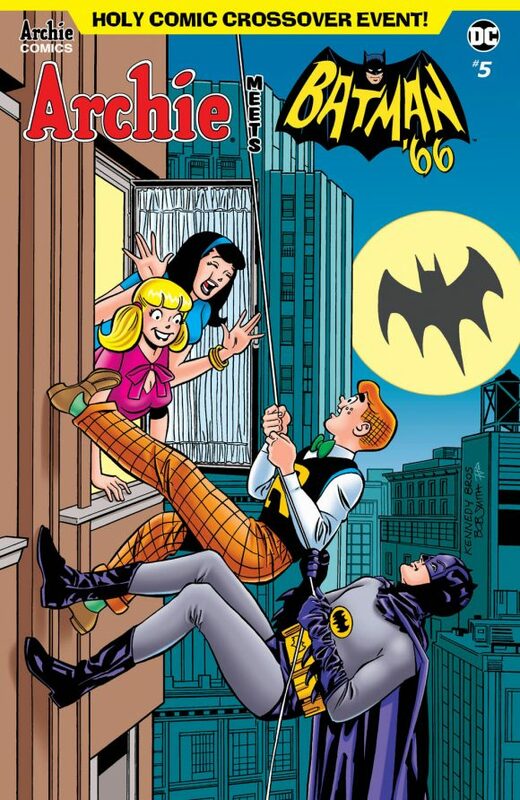 Ms. Cooper and Ms. Lodge join the litany of luminaries who’ve greeted the Caped Crusader at the window on this ARCHIE MEETS BATMAN ’66 #5 variant cover by Pat and Tim Kennedy, Bob Smith and Rosario “Tito” Pena. Oh, and Archie’s along for the Bat-climb! And don’t forget — Adam West’s birthday is Wednesday (9/19). Keep an eye out for the special Bat-festivities here at 13th Dimension.